TV with Thinus: TV REVIEW. The Game of Thrones season 8 premiere signals that this Neverending Story will have an end. TV REVIEW. The Game of Thrones season 8 premiere signals that this Neverending Story will have an end. 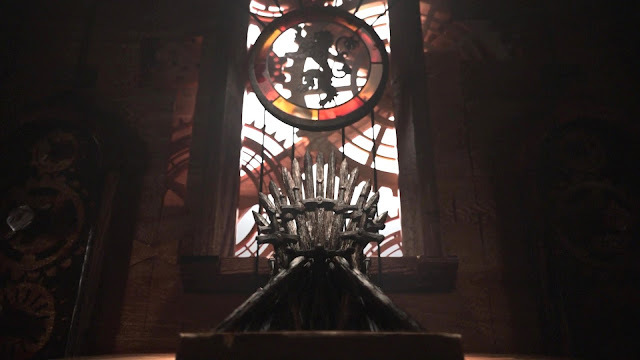 The following review contains a few unavoidable spoilers regarding the Game of Thrones season 8 premiere. At Monday morning's Nu Metro big-screen cinema screening in Cape Town at 03:00 of the premiere episode of the 8th and final season of HBO's Game of Thrones on M-Net (DStv 101) someone won a set of GoT dinner plates - perfect for the season's first episode that didn't, and couldn't, feature a lot of action as the fantasy series had to start to (re)set the table to tell the last part of the story. After an absence of 20 months, viewers are getting their first new Game of Thrones episode and it didn't disappoint although it might feel slightly "average" compared to what came before. It's necessary since characters need to be reintroduced to the audience and each other and literally moved to new places on the sprawling Westeros map - as illustrated by the magnificently updated and changed Game of Thrones opening sequence that looks terrific. The season 8 premiere episode starts off formally with an army marching into a new home at Winterfell, has a cutesy - maybe too-cutesy? - Neverending Story-like dragonriders sequence in the middle, and then a horrific and scary part at the end just to remind viewers what they're actually watching and that is foreshadowing the brutal clash that is surely coming between Westeros' humans and the undead White Walkers led by the Night King. The first episode can definitely be classified as a reunion and includes some must-do visual and verbal exposition from dungeons to dragons and Jon Snow (Kit Harington) being told about his true parentage. Viewers see several old friends, frenemies, family members, family frenemies and foes meet up, reunite with some actual time for discourse and discord. Thought things would be fine and stay fine between Jon and Daenerys Targaryen (Emilia Clarke)? Sorry but this ain't that kind of fantasy story. Thought things would be fine between brother Jon and sisters Arya (Maisie Williams) and Sansa (Sophie Turner)? Clearly it won't be. And in the final moments of the season premiere, a deliciously ominous "reunion" between Jaime Lannister (Nikolaj Coster-Waldau) and Bran Stark (Isaac Hempstead Wright) who he tried to kill years before, shows how the opener is setting up physical showdowns between enemy and enemy, in various forms, who are all finally going to come face-to-face with each other. Dragon-parts, done well. Some dry humour parts, done well ("Poor girl, the pox will take her within the year"). A spider-like, spiral-mural horror-scene, done extremely well. There are not really grand visual statements, massive surprises, gory ends to main characters but as the knives, forks and dragon glass forged weapons are being laid out, you know they're coming as surely as the undead army is advancing from beyond the now broken wall. "Nothing lasts," declares the character of Varys in the episode - signalling that this fantasy Neverending Story does and will have an end and that viewers better enjoy the last of the quieter times before the final chapters featuring all-out battle sequences and with it the horrific devastation that is looming. ALSO READ: MultiChoice and M-Net dropped DStv subscribers in South Africa and across Africa in the cold when its untrustworthy DStv Now app again crashed with technical issues, as its pay-TV customers tried to watch the start of the 8th season of HBO's Game of Thrones.